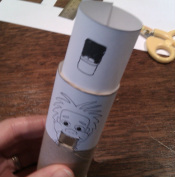 Make your own mini-Dudley puppet! Cut out the two rectangles from the puppet template. One has Dudley's face, one has a mouth. Carefully cut a rectangle to remove Dudley's mouth from his picture, and also cut out the black rectangle to the right of the paper. 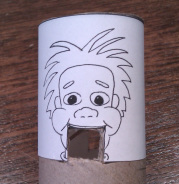 Wind the paper around the cardboard roll. Attach it in place with glue or tape. 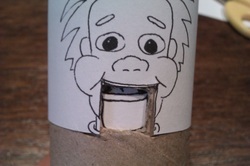 Ask an adult to use the knife to cut a square in the cardboard to match the opening for Dudley's mouth. Turn the puppet around and ask an adult to also cut a longer rectangle in the back, matching the section you have already cut from the paper. 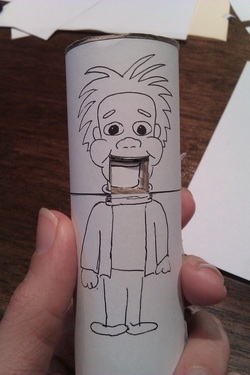 Roll the piece of paper with Dudley's mouth printed on it into a tube. 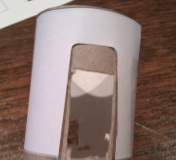 Adjust the size so it fits inside the cardboard roll. Stick it together as a tube once it is a close fit but can still slide up and down. 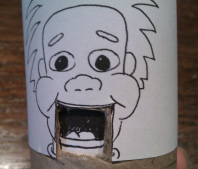 Slide the mouth tube down inside the cardboard tube until you can see the mouth has lined up with the hole where Dudley's mouth is. Turn the tube around so you are looking at the hole in the back. Use a pencil to mark where the inner tube matches up with the hole. Slip the inner tube out and cut a finger-sized hole where you marked with the pencil. The hole should not be as big as the hole in the cardboard. Instead the hole should only be as large as the end of your finger. Slip the inner tube back inside. When you put your finger in the hole in the back you can then make Dudley's mouth go up and down. Use some more paper to draw a body and clothes for Dudley. You can dress him however you like. 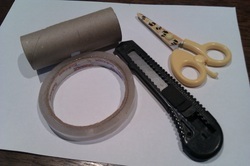 You might even like to get some scraps of material and glue them on to make a little outfit. Your imagination can get as creative as you like! Now, if you need some inspiration, read Andrew's bio page and then start practicing! As the website grows I'd love to have a place where people can upload their act using their new puppet. We will keep chatting with the computer boffins and see what we can come up with.